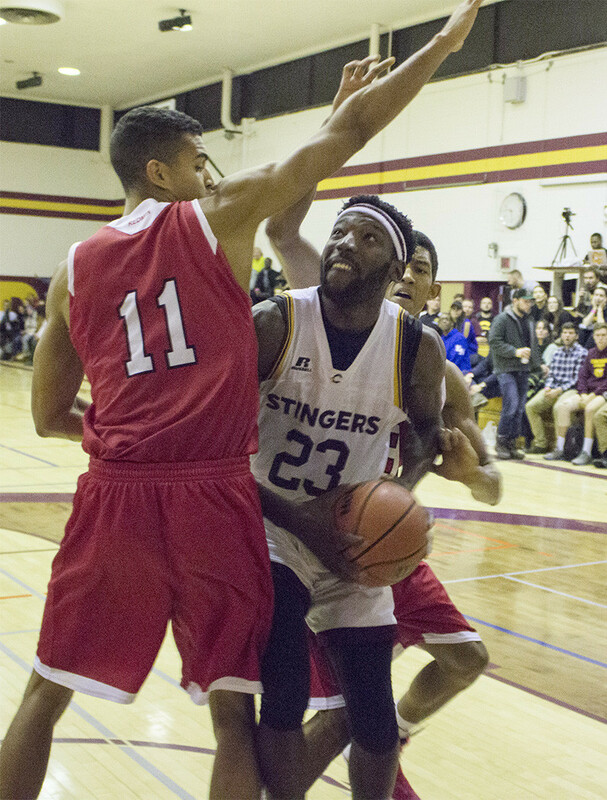 Since Schneiders Suffrard joined the Stingers men’s basketball team in 2015, he has been a regular starter at the small forward and shooting guard positions and has been one of their primary scoring options. Entering his third season at Concordia, the Laval native has bulked up to allow him to transition to playing the power forward position. Power forwards who can shoot effectively are popular in basketball across all levels these days. That position has been called the “stretch-four” because the power forward, who typically plays close to the basket, is also capable of moving to the perimeter and shooting the ball from distance, stretching the floor. Suffrard had a rough year shooting the ball from distance last year. He connected on only 16 per cent of his shots from beyond the arc. However, he only attempted 37 shots from three-point range—a low number for someone playing his position. Considering he mostly played small forward, he was often drawing the opponent’s best defender, limiting his ability to find open shots. As a “stretch-four,” he’ll likely draw a slower-footed defender which will allow him to use his speed to create easier opportunities from three-point distance. “He’s still learning how to play the position defensively, but he understands that he’ll be able to take advantage of his athleticism to step outside and find open opportunities from all over the floor,” said Popovic. Schneiders says he’s been studying perennial NBA all-star Chris Bosh, and using him as a model for how to play his new position. He noted the importance of learning from other people and analyzing how they make mistakes and what they do to correct them. With Suffrard slated to slide in and become the starter at power forward, there will be more stability in Concordia’s starting five this season. As of now, Popovic expects fifth-year player Ken Beaulieu to be the starting small forward and sophomore Nicholas Noble to start at shooting guard. Suffrard is optimistic about the versatility he’ll now be able to bring to the team. “This adds a new dimension to our team,” he said.